266-322 King Street West – Bousfields Inc.
Bousfields was retained by Ed Mirvish Enterprises Limited (c/o Projectcore Inc) to prepare the Planning and Urban Design Rationale for their proposal for the site at the junction of the John Street Cultural Corridor and King Street West. The project is for a trilogy of three iconic and tall residential towers situated above a street-related frontage of mid-rise buildings containing institutional, commercial and arts uses. The proposal visually and functionally signify the location on the skyline and at the level of the street, and amplifies the location’s heart at the centre of the City’s entertainment district. Programmatically the proposal secures the historic Royal Alexandra Theatre as a live-performance theatre, adds two significant new art galleries to the area, provides new space and facilities for OCAD University, adds new retail space, and adds new residential units to the area. The project was designed by architect Frank Gehry. Bousfields prepared a Planning and Urban Design Rationale, which set out the planning and urban design logic of the proposal and how it fits both its policy and physical contexts. The report was published in October 2012. 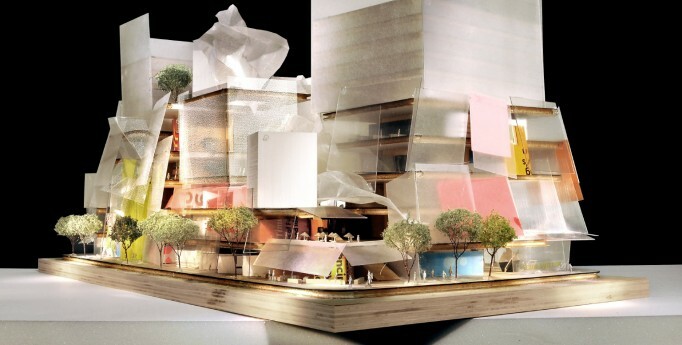 Images courtesy of Gehry International Inc. Client: Ed Mirvish Enterprises Ltd.